The first place to fish in the Dakotas each spring, and the first place to catch fish in the spring, is the Missouri River system. And this spring, anxious anglers were greeted with one of the earliest ice-outs ever. Weak ice over much of the Missouri River Basin took a break, no pun intended, in late February. Traditionally, ice-out on the frozen parts of the Missouri River, mostly which exist in North Dakota, don’t occur until mid-March, give or take. In most portions of the River in South Dakota, ice isn’t a factor on the Missouri River system, and anglers, those who tough it out, fish all winter long. Most of that open-water activity, of course, lies in the southern portion of the river. It’s in North Dakota where winter-weary walleye wishers wait for the magic day on the Missouri River: Ice-out. From the time the last chunk of jagged ice floated past shorelines on the river in late February, anglers readied their boats and slid into the frigid waters. And since then, it’s been busy. So busy this spring in fact, on mild weekends, between windy periods, which comprises 5 to 6 days each week in the spring in the Dakotas, it’s not been uncommon to count more than 100 boat trailers on popular ramps south of Bismarck and Mandan. The northern boundary of Lake Oahe in North Dakota lies about 20 miles south of Bismarck/Mandan. That’s where walleyes seem to stage their spring migration, if there is, indeed, a migration. Fisheries biologists say there is not, anglers differ. When ice moves out on the Missouri River system in the north country, it’s time to fish. Friendly weather accelerates fishing activity, but even on the most blustery spring days, there will be fishermen. On weekends, in periods of congenial weather when wind takes a break, well, if you’re one of those folks who likes to go it in solitude on the river, you’re in for a challenge. The Missouri River system is getting more popular each year, particularly each spring. More and more, anglers far and wide are making the trip to the great walleye factory, mostly because it’s open. It’s available. It’s productive. It’s the first open-water place of the new season. And if it means struggling for space amidst a large group of boats to tally a limit of precious walleyes, so be it. This isn’t a vacation trip with mom and kids. It’s a mission. It’s a blood-and-guts tough-it-out fishing excursion. It’s walleye fillets, crisp and thick from ice-cold, clean water, fried in cracker crumbs and onions, and served to those who treasure the best tasting fish on earth. It’s worth most any inconvenience… to many. “It’s amazing what it must mean to catch a limit of walleyes,” said North Dakota fisheries chief Greg Power of the high number of anglers on the system south of Bismarck/Mandan in March and April. This spring on the Missouri River system in North Dakota seems to have drawn more attention than any other time in history. Hundreds of boats, mostly big boats, have launched daily since late February into the system south of Bismarck/Mandan, many coming out with limits of walleyes. If you talk to anglers, some catch fish, some don’t. But they’re all catching something. The spring of 2016 on the Missouri River won’t likely go down as historic regarding walleye activity, but that won’t discourage winter-weary walleye fanatics. Those who are willing to work hard, travel any distance in the face of wind, morning temps in the 20s and so much clothing they can hardly set a hook, well, the trip will pay off. And the fishing pressure is increasing dramatically each spring, this spring showing the most anglers ever, according to some observations. At first glance, the “locals” in the Bismarck/Mandan area wonder how much their cities have grown. Who are all these people? Has interest in fishing grown that much in recent months… years? Truth be known, folks are now coming far and wide to cash in on the abundant walleye resource of the Missouri River system. Locals are there, but they no longer dominant the activity. Fishermen come from Jamestown, Fargo, eastern Minnesota, and points west from Dickinson, even Glendive and Billings. When you cruise a parking lot at popular ramp areas like Ft. Rice, Hazelton and others, you see license plates from Minnesota, a few from Montana. 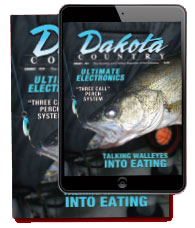 Minnesota doesn’t have the resources of the Dakotas in early spring, their season closed to gamefish until mid-May. When the urge to cast a jig fills your nighttime dreams, you have to travel to fulfill that desire. The Dakotas and the Missouri River are the logical choice. Local anglers who fish the system, and who have fished the system for decades, say they’ve never seen so much boat traffic in their lives. Ramps that, years ago, were full with 20 trailers, have now been expanded to hold 100, and when that isn’t enough on mild weekends, anglers park on highways and walk 2, 3 and 4 blocks back to the dock to jump in the boat. “I’ve never seen so many boats here in my life,” said Mike Barness of Bismarck, after counting more than 100 rigs in parking lot of the Ft. Rice ramp on April 2, a sunny, calm day of 70 degrees. “It’s just amazing. I’m astonished the impact fishing has on people. But I’m also concerned about the resource. Is it possible we could severely hurt the walleye population? Biologists say no, because limits are in place, but also because walleyes, like other species, are abundant, pulling off strong year-classes only periodically. Many more fish die of old age than are caught by anglers. Most of the walleyes being harvested this spring are the result of a strong 2009 hatch. That makes them seven years old, and their lifespan is fading. Power emphasized that abundant walleye year classes, as well as hatches from other species, are infrequent in the Missouri River because of unstable water levels, so biologists and fishermen are happy when a good reproductive year is seen. Power said the doesn’t expect a strong walleye hatch this spring because there’s been little runoff into the system. But as fishing pressure increases dramatically each spring on a small portion of the system, could the impact be more detrimental than we might believe? Another long-time veteran angler of the river system in the Bismarck/Mandan area, Lyle Gallagher, is worried about the impact. Gallagher is familiar to Dakota Country readers for his insightful stories of outdoor life in the Dakotas, and he’s fished the Missouri River system since the first walleye laid an egg in the mouth of the Cannonball River. Gallagher is among a growing number of folks who’ve actually changed their fishing priorities on the river. They will not venture out on weekends, and try to confine their fishing time to low-impact spots further north in the system. He catches fewer fish, but there’s solitude. The growing crowd on the Missouri River in the spring, Gallagher said, has altered his fishing priority. 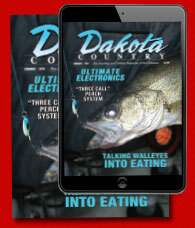 Interest in fishing has grown rapidly in the Dakotas the past half dozen years. Abundant water and a responding fisheries management program to stock newly-formed water has drawn anglers in highly increasing numbers. Build it and they will come. Well, they’re coming, and the Missouri River is getting major attention. If you’re tolerant of crowding, constant waves, even some hollering, jams at boat ramps during the evening rush, you’ll do well. Likewise, there are those who won’t join the fray, even amidst easy limits of walleyes. As for the 2016 Missouri River walleye bite on upper Lake Oahe, it’s been good, but not sensational. During this particular ritual, it’s not an adventure thing as much as a fish-food quest, pure and simple. It’s the marvelous taste of pure, cold walleyes. People are hungry for fresh fish, but people being people, there are varying concerns. “People complain when fishing is poor and they’ll complain when it’s too good,” Power said. Sometime this month, fishing pressure on the Missouri River will lighten. Anglers will move onto other waters, as small and mid-size lakes “turn on.” Walleyes will still be the target, the major player, but abundant resources and warmer, more stable weather will allow fishermen a little more room and a chance to keep putting walleyes on the table. Where's that water coming from?